Let’s face it, most of us that live in the Gulf Islands and most that visit the Gulf Islands arrive courtesy the fleet of ferries run by the British Columbia Ferry Services Inc. The BC Ferry system is coming up on its’ 50th anniversary with service beginning in 1960 with two ferries and a dream. Today, the ferry system comprises 36 vessels, calls to 47 ports and is one of the largest and safest fleets in the world. While many Gulf Islanders will mumble about the ferries being late and the ever increasing costs; the bottom line is the fleet is well run and surprisingly affordable compared to many other countries in the world. We certainly can’t compare our fares and service to the Philippines! 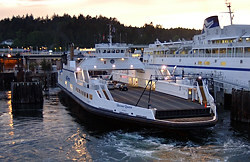 The Gulf Islands fleet comprises mostly small vessels with the larger ferries being used on the Tsawwassen – Victoria, Tsawwassen – Nanaimo and Horseshoe Bay – Nanaimo routes. The largest of the Gulf Island ferries is generally the Queen of Nanaimo. This ferry has capacity for 192 cars and 1,004 passengers and crew. The Queen of Nanaimoand runs between Tsawwassen and Salt Spring Island with stops at Galiano Island, Mayne Island and Pender Island. Within the islands, the Queen of Cumberland and Mayne Queen shuttle people around the small islands with a final stop at Swartz Bay near Victoria. 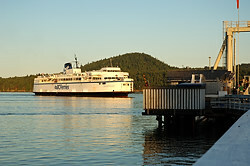 Salt Spring Island has two additional ferry routes in addition to the Salt Spring to Tsawwassen route. The Skeena Queen ferries people between Fulford Harbour and Swartz Bay while the Howe Sound Queen serves the route from Vesuvious on Salt Spring to Crofton on Vancouver Island. To the north, The MV Kuper makes the run between Chemainus on Vancouver Island and Kuper Island and Thetis Island. From Nanaimo, the Quinsam runs regularly to Gabriola Island.